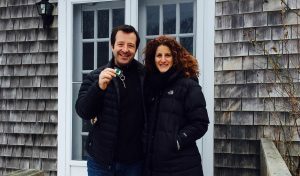 A major part of the reward of being in real estate is hearing the happiness and satisfaction our clients’ experience as a result of our helping them to achieve their dream of owning a home on Martha’s Vineyard. Customer reviews tell us how we’re doing. Please see the customer reviews below–we are proud of what they have to say! And please contact us if you have a question about our customers’ experience. Bought a single-family home in 2017 in Vineyard Haven, MA. (Broker) David (Lott’s) knowledge of the island was invaluable, he adapted as our property type interest evolved during our search. David’s closing attorney recommendation was very valuable in understanding the property and completing a smooth close with Attorney Dubin. –Kirk S.
Bought a Single Family home in 2017 in Vineyard Haven, MA. Working with David was a pleasure, and in addition to our agent, we’re pleased to call him a friend now. With a real estate search that began a couple years (and 9 houses) ago, David was persistent and coached us along the way…He is always quick to respond, ready to answer a question, suggest a strategy or provide insight into island life for out-of-towners like us. Having a deep local perspective makes a world of difference in being an informed buyer, and it ultimately paid off with a great house for our family. We highly recommend David and his team for your Martha’s Vineyard real estate needs. Bought a single-family home in 2014 in Oak Bluffs, MA 02557. David was excellent from start to finish. He was very responsive to questions and was proactive in researching other options and comparative properties to ensure our full market awareness. He proved to have a great deal of experience and tact in closing our agreement. I would definitely recommend David Lott. Bought a Single Family home in 2015 in West Tisbury, MA. I’m so pleased to be writing a review for David Lott! We never would have found our dream home without him. From day one his enthusiasm, warmth, patience and knowledge were evident. And, most of all, these traits never waned as we saw some 66 homes! David’s expertise should also be noted. For an individual relatively new to the trade back then, he was a true professional. Finally, the care we received every time we looked at homes was superior. The process of buying a home can be grueling at best– David always took our well-being into consideration and made our long house-hunting days a pleasure. Now that we have bought our home, we intend to use David as our rental agent. Clearly, we are happy to continue working with him now and in the future. Helped me rent a home in Vineyard Haven, MA 02568. David took the time to understand what I was looking for in a rental. He is a good listener, highly motivated and extremely caring. After a couple of days, he found the rental I was looking for. Found a tenant for a Condo home in Avon, CT.
Kristin rented my home on Martha’s Vineyard and I was very pleased with her service and so was the tenant with the service Kristin provided. She is very professional, nice to work with and pays attention to detail. Showed home in 2014 in West Chop, Vineyard Haven, MA 02568. Kristin Zern is a highly regarded professional in the real estate community. I have worked with her on more than one occasion and she has always worked tirelessly to meet and exceed my needs and expectations. She has always been on time to our meetings and totally professional and most of all helpful and knowledgeable about her field of expertise. I would highly recommend using Kristen Zern for all your current and future housing needs.